Kettler has been manufacturing high quality garden furniture for more than 30 years. Among the sport and leisure products that the company manufactures, their wicker garden furniture sets are among some of the most popular. They offer a natural look that is the perfect aesthetic fit for the garden or in a conservatory, and they are made from durable and hardwearing materials. Wicker furniture is not only durable and long-lasting but is also lightweight so is easy to move in and out of the garden. Weight is kept to a minimum by wrapping the handwoven wicker over an aluminium frame. The Kettler Harlow Carr garden furniture range is made in partnership with the Royal Horticultural Society, and is one of a series of garden furniture models that are part of the Kettler RHS partnership. 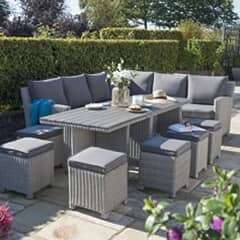 If you're looking for lightweight outdoor or conservatory furniture that is made from natural looking fibre, but has all the benefits of being weatherproof and sturdy, you can buy the Kettler Harlow Carr garden furniture set directly from our secure website, call us with any questions about the set, or call in to Dawson's Department Store to view our full homeware range. If your order is �50 or more, we will deliver free to your UK address. The Kettler RHS collection has a wide range of furniture options, including sets designed for use on the patio, in the garden, and in the conservatory. The furniture that makes part of the collection includes 3 and 2 seater sofas, chairs, and tables. Cushions include the RHS logo, and all the items in the Kettler RHS collection are designed to fit, aesthetically, in the natural surroundings of your garden. They are comfortable and stylish, and as well as the wood collection that has loungers for relaxing in the sun, there are also attractive and comfortable wicker furniture sets. Wicker furniture is often chosen for its good looks. It fits perfectly in the garden or conservatory because of its natural looks. It can be combined with other materials like wood, metal, or glass, to create a unique style. It is also surprisingly hardwearing and durable, is lightweight so makes a convenient material for manufacturing furniture, and it can be treated to give it even greater weatherproof properties. A bistro set is a dining set designed for 2. It incorporates a moderately small table and two chairs. Reminiscent of dining sets found outside European cafes and bars, the sets are small enough that they can be used in gardens of any size and are ideal for one or two people. The 2 seat Kettler Harlow Carr garden furniture set includes a small round table, with glass top, and two wicker chairs with arms and RHS branded cushions. The furniture is sturdy and strong but is lightweight and convenient and easy to move. The handwoven synthetic wicker, which is chosen for its additional strength and weatherproof properties compared to natural wicker, is applied over an aluminium frame. 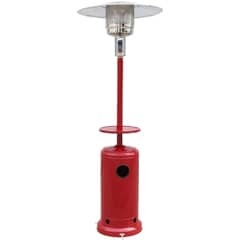 It can be left outdoors all year round but is also light enough that it can easily be moved indoors during the wet and cold months of winter. The dining sets that make up this range of RHS branded furniture include a similar glass topped table as is included in the bistro set. Rather than 2 seats, however, you get 4 of the same dining style wicker chairs. You can enjoy the same lightweight, weatherproof, and surprisingly durable wicker benefits and when you spend more than �50 we will deliver to your UK address. Dining sets are ideal for families or groups of 4 or more people. Additional chairs can be purchased to increase the size of the set, and all of the furniture, including the table and even the chair cushions, are designed to be quick and easy to clean as well as attractive. As well as dining sets, the Kettler Harlow Carr garden furniture range also includes lounge sets. These include glass topped tables and, as well as two or more dining chairs, they also include a 2-seater or 3-seater settee. If you are looking for a comfortable seating option for use in any outdoor location, the lounge sets from Kettler are a great option. Lounging sofas are also available separately, which means that you can buy comfortable seating to match the style of your dining set or simply because you want additional seating options in the garden. Like all Kettler Harlow Garden Carr furniture, it is easy to maintain, and the furniture can be left out all year round, although you should take the cushions in. The glass table top and furniture can be easily cleaned by simply wiping it down with a damp cloth. As wel las buying dining and lounge sets, you can also buy Kettler Harlow Carr garden chairs individually. Choose between dining chairs, which offer a more upright position and sturdy arms that will take your weight, or a selection of 2-seater and 3-seater sofas. You can either buy additional chairs as occasional furniture pieces, to extend an existing RHS branded set, or simply because you like the design and appreciate the sturdiness and longevity of the synthetic wicker material. At GardenFurnitureWorld we also have a number of Harlow Carr garden tables. These are designed to be used with the furniture sets, have the same style and design, and use the same aluminium frame and synthetic wicker weave as the sets. Side tables are a great addition to a covered patio while the beautiful coffee table can be used in the conservatory. The RHS branded Harlow Carr garden furniture sets are especially well suited to use in the conservatory. The room itself is meant to combine the indoors and outdoors, and the wicker material does exactly that. It looks natural, despite being stronger synthetic, and it will fit with a light and well-lit conservatory design. Kettler has combined with the Royal Horticultural Society, RHS, to create this branded range of Harlow Carr garden furniture. The range includes dining and lounge sets, or you can buy pieces individually in order to create the look and set you want. The natural appearance of wicker has been captured perfectly in the synthetic weave that is used, and Kettler has combined this with durable glass and high quality but lightweight aluminium frames. You can even buy coffee tables and side tables to combine with your chairs and dining tables. 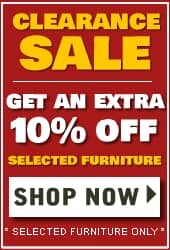 At GardenFurnitureWorld we have a full selection of Harlow Carr garden furniture. We have bistro sets, which are ideal for 1 or 2 people, as well as dining sets that can seat 4 or 6 people. We also stock individual chairs and additional tables with the same RHS branding on the cushion. We offer free delivery on all orders over �50, which means that you can have your new, high quality furniture set delivered to your door. 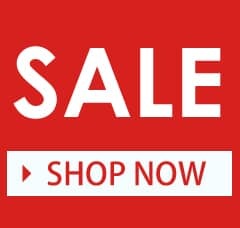 Browse the site, call us with any questions about individual items, or call in to Dawson's Department Store in Clitheroe where you can see our full homeware range.